Li-Ming is a powerful ranged Assassin that is capable of dealing enormous damage. She has a unique Trait that allows her to reset the cooldowns on all her abilities when she kills someone, and this puts her in a powerful position to snowball enemies when they begin to die. Unsurprisingly, she's very squishy and like Kael'thas or Jaina, can die in seconds when she's focused. Fortunately for her, she has several talents as well as Teleport to get her out of most challenging situations. Despite that, positioning and focusing targets that are vulnerable, to maximize your Trait's use, is key to succeeding with her. Critical Mass (Trait) - This allows Li-Ming to reset her cooldowns when an enemy Hero is killed. Whether Li Ming lands the takedown or if an ally does it, as long as she's near the trait will trigger. It's invaluable in a team fight and allows you to snowball very hard, especially when you factor in the burst that Li-Ming is capable of. It's also important to note that Critical Mass resets your Ultimate ability every time it triggers. Magic Missles (Q) - Firing three projectiles at a reasonably slow pace, Magic Missiles strike and deal damage to the first enemy you hit. Due to the nature of their attack, you can actually adjust their trajectory. Want them to pinpoint one target? Aim as far away as possible. Want them to fan out and fly in seperate directions? Target close towards you. It's a clever abilities that's great for poking based on its short cooldown. If all three hit, its damage is super high. Arcane Orb (W) - Firing a slow moving projectile, Arcane Orb deals more damage the further away it travels, up to a maximum of around 800 (give or take). Although it deals the most damage when cast from afar, don't underestimate it's damage potential when used at close and mid-range. In most circumstances if you use it from afar against anything other than a Keep, you're going to miss. Using it at functional ranges is far more reliable but that doesn't mean you shouldn't poke with it. When it does connect having travelled maximum distance, it seriously hurts. Teleport (E) - Li-Ming's only form of escape, Teleport allows you to blink to another location instantly. Its range is very, very short and because of that, it should be looked at as a skill to avoid a specific attack or to edge away from an enemy who gets too close. When talented it's actually possible to make it a very offensive skill with a rotation capable of dealing enormous damage (Arcane Orb > Magic Missiles > Teleport). It has a short cooldown and low mana cost and despite its limited range, it's invaluable. Disintegrate (R) - Li-Ming will channel a beam of light at her foes, in a straight line. Anyone caught in the beam will take damage over the period that they stand in it. In some respects, it feels a bit like Nazeebo's Ravenous Spirit in the sense you're stood still while firing a projectile forward, dealing damage to all in its path. Against minions, camps and structures it's fab. Against players? Not so much unless they're incredibly low health. If you do find the enemy team low health however or if they're caught with crowd control, Disintegrate can clean up in an instant. Wave Of Force (R) - The go-to Heoric against melee or dive compositions, Wave Of Force allows Li-Ming to knock all enemies away from an area and deal damage to them in the process. The damage is good, the knockback instant and if timed with teleport (once talented) it allows for amazing burst potential. Wave of Force, also being a knockback, is invaluable for interrupting chanelled Heorics. Power Hungry provides Li Ming with 100% more mana from Regeneration Globes, while granting 10% Spell Power for 20 seconds. When fighting in lane, or near to a lane (or a captured Objective and/or Camp) it provides some much needed sustain. Variable: I really like Aether Walker simply because it always ensures Li Ming has an escape. Removing the mana cost of Teleport is great if you haven't been attacked in 5 seconds. It also reduces the cooldown on Teleport by 2 seconds. Considering you should always be at the back, it's easy to maintain. During a team fight it's often gaurenteed that someone will die, so taking Dominance allows Li Ming to regain almost 30% of her health every time someone does. This allows her to really maximize her teleport damage at level 7 for maximum survivability and she can, more often than not, come out of a team fight with full health if there's a team wipe. Variable: Reducing the cooldown of Arcane Orb by 5 seconds if it travels 65% of its distance and hits a Hero, Triumvirate allows Li Ming to pump out high damage consistently in a team fight. It's fairly hard to miss with Arcane Orb and considering you should always be at maximum range, triggering this talent is easy. Fantastic on objective based Battlegrounds that require interaction. Calamity is incredible for experienced Li Ming players. Allowing her to teleport into a fight after firing Arcane Missiles and her Arcane Orb, it provides enormous burst potential. By default your Teleport has a short range so you need to get up close and personal to maximize this. It tends to truly come into play during later talents. 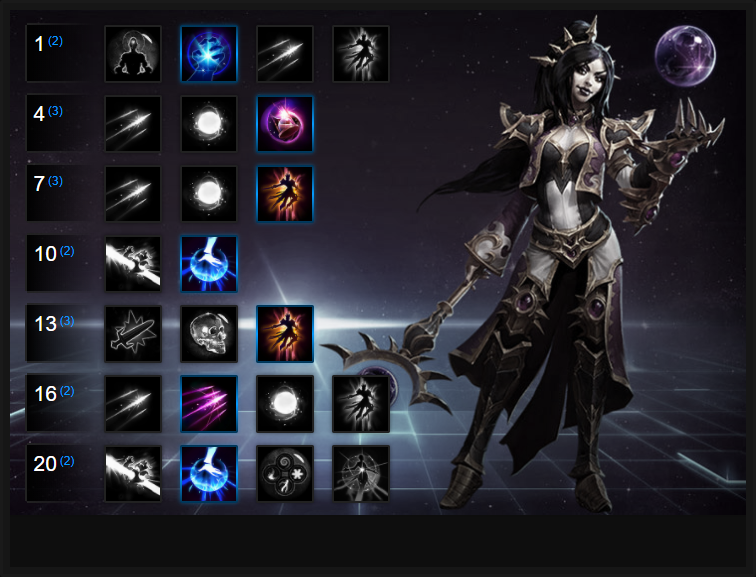 Variable: Poking with Arcane Orb is key to Li-Ming's play, and Zei's Vengence improves on this potential. Hitting enemies from afar will now increase its damage by 25% and considering most of the time you'll be at maximum range, it's easy to nuke someone down in almost one hit. Against melee heavy teams or when needing the ability to interrupt, take Wave of Force. It might be short range, but it'll save your life many times over against the likes of Genji, Tracer or Diablo. Wave of Force also allows Li Ming to perform a high burst rotation, diving in with Teleport followed immediately by it. Variable: Although it's difficult to keep Disintegrate on a target, it's the ranged poke combined with the damage that makes it valuable. Its range is absolutely huge, allowing you to safely deal damage from afar without fear of being attacked. Grab this if you aren't against a melee or dive heavy composition. Illusionist is often a must to build into the Teleport playstyle of Li Ming as it increases its range significantly, allowing you to drop your ranged abilities before zipping into combat. It also means that if you're against a high DPS Hero such as Nova or Zeratul, it'll refresh instantly when you take spike damage to provide much more survivability. Variable: Undoubtedly a high risk, high reward talent, Glass Cannon boosts Li-Ming's damage by 15% but also lowers her health by the same amount. It's worth it as far as I'm concerned and if you've a competent healer on your team, you've very little to worry about. The only difference is you'll now deal much more damage. Allowing Magic Missiles to fire two additional projectiles for an extra 5 mana, Mirror Ball allows Li Ming to deal much higher damage with her one-two punch combo (Arcane Orb > Magic Missiles > Teleport). Variable: If you find you're taking too much damage, too often, take Diamond Skin. It provides you with a 25% maximum health shield after you use teleport which is great for surviving once you've used your burst rotation. It's also brilliant when escaping from targetted spells such as Kael'thas' fireball. Repulsion is a simple, but effective upgrade on your Heroic, allowing your knockback to be increased by 150%, and the cast range by 100%. When you need to poke with it, or create greater disruption, it's mandatory. These Hero Threat Levels (1 being lowest threat and 10 being highest threat) are to help you determine which enemy Heroes can give you a headache. For the Heroes listed here, take extra care as they're particularly dangerous for Li-Ming. Jaina: She's a threat because of her ability to slow you and as a result, you'll struggle to escape. Although your teleport can help avoid some of her skills, she's a nuisance. Kerrigan: Her shielding, stun, leap and pull makes life very difficult for Li-Ming. If she gets too close, you have to teleport away but it's most likely she'll already be on you again. Lunara: Her damage over time, mobility and range make her a headache - especially now they've fixed her stutter stepping. With no crowd control, you'll have a hard time landing skills against her. Nova: By the time you've teleported, you're going to have taken a huge amount of damage before you even know what has hit you. There's little you can do once she appears if her aim is good. Raynor: His auto attack damage is enormous and his stun on his knockback can absolutely destroy you. He has better range, can attack quickly and heal himself. Try to avoid or have your team focus him early. The Butcher: Lamb to the Slaughter combined with Butcher's Brand will absolutely destroy you. Without a means of escaping, you're going to die. Thrall: Self healing, a powerful stun Heoric and a root make life for Li-Ming pretty miserable. If he does root you, you need to hit him with everything you've got, as quickly as possible. Preferrably, use Teleport, re-position then attack back. This list of tips and tricks are just a handful of things we think will help your Li-Ming play. We'll continue to add to the list as required and if you have any tips you'd like to share, let us know in the comments below and we'll place them here. 1. Your highest burst is Arcane Missiles > Arcane Orb > Teleport > Wave of Force. In total, it's well over 1500 damage in one second. 2. Remember that Arcane Orb deals more damage the further away it's cast. It works best against objects that aren't going to move out of its way (Keeps/Gates). 3. Arcane Missiles are flexible in where you send them, but they obviously deal the most damage when fired at a single point, rather than multiple. 4. It's important to maintain 4 stacks of Force Armor before going into a fight. This'll significantly improve your survivability. 5. Always try to spike down the lowest health Hero with Teleport > Wave of Force to trigger your trait. You'll then be able to follow up with Arcane Orb or Missiles and maintain Tal Rasha's Elements. 6. If you take it, be conscious of the fact Glass Cannon reduces your health pool. Just take a little bit more case when fighting. 7. Wave of Force is also a knockback and despite its short range, can be useful at disrupting enemies who are trying to chase you or an ally. 8. Arcane Missiles has a very small cooldown and a low mana cost. It's your best skill for poking from afar. 9. Practicing the firing pattern of Arcane Missiles is worthwhile. They're tricky to get used to, but great for finishing off a few players if you can aim them just right. 10. Teleport isn't really an escape skill but outside of its value to hurt, should primarily be used to avoid large or predictable skills that deal high damage. 11. If you've picked up Disintegrate, try to save it for when Heroes are low health and close to you, so that they can't escape the beam.